Scotland’s favourite hiking trail, the West Highland Way, is a 96 mile adventure on foot from the edge of Glasgow’s urban sprawl into the wild Highlands, and onward to the west coast of Scotland in Fort William. Each year we organise 1000s of walkers’ trips on the West Highland Way, and encourage our hikers to share their favourite moments with our community of adventurous spirits using #MacsMoment. These are some of our favourites, summing up the West Highland Way experience in special memories and inspiring moments. In any weather, the scenery is what draws people from the world over to this part of Scotland. Whilst a walking adventure is the ideal way to spend some solo time in the peace of nature, bringing friends & loved ones (or even making friends) is a great way to share time and experiences. Even the Macs Adventure team enjoy time together on the trail (in this case with more than a little rain thrown in too) when we can! So the sun may not always shine on the Scottish Highlands, but that doesn’t matter. Part of what makes the landscape so interesting is how the scenery changes in different lights and weathers, even changing minute by minute sometimes! Any sorrow that the adventure is over is more than made up for in the sense of achievement! 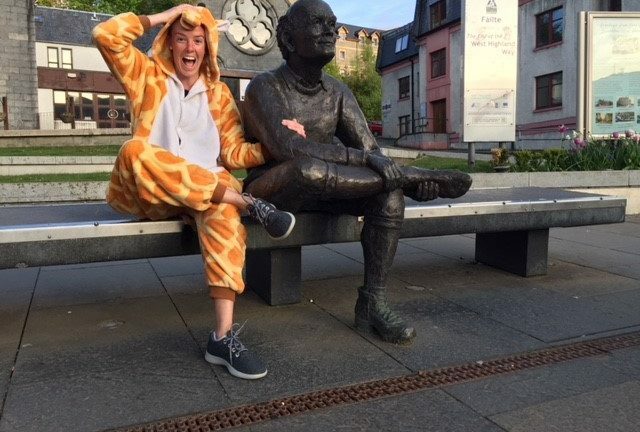 Don’t forget the obligatory snap with the “sore feet” statue at the end of the West Highland Way. Inspired? We specialise in West Highland Way walking tours in a variety of durations to make the trail as relaxed (or as much of a challenge) as you like, including accommodations and daily baggage transfers (contact [email protected]). However you choose to explore this part of the world, you’re guaranteed moments like these to remember!